Happy Thanksgiving!! Ours is off to a roaring start, I already spilled bacon grease all over my stove (yuck) and almost dropped the Turkey while trying to flip it over into the roasting pan, man those things are slippery! But while dinner is cooking, I wanted to take a quick second to wish every one a great holiday. 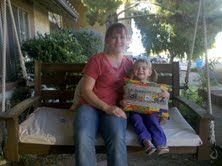 "Thankful" row made it back just in time for Thanksgiving. I am so happy with it. I rarely have things professionally framed, but always love them when I do. 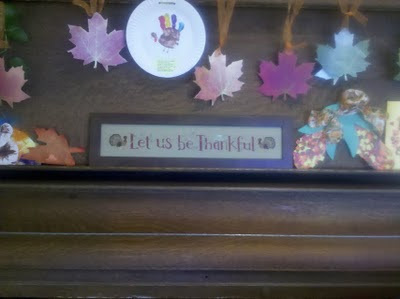 This is "Thankful" among my Thanksgiving display on my piano. We still have the little pumpkins left over from Halloween. And the fall garlands I got for 60% off after Halloween. I love the color they bring into my living-room. 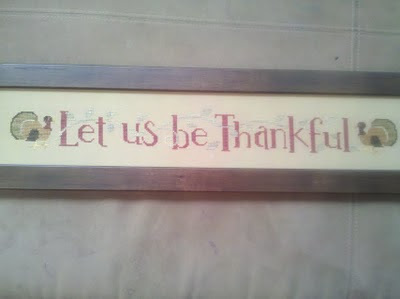 All the little crafts next to Thankful are courtesy of my four year old and her wonderful preschool teacher. Someday I will miss having little painted turkeys made from tiny hands. And this is the gobble-gobble quilt top. Another one that was done just in time. I love the punch of color brought from the bright red binding. Please ignore how clean our couch is, it is old and well loved by snacking children and dirty dogs. But we wouldn't have it any other way. 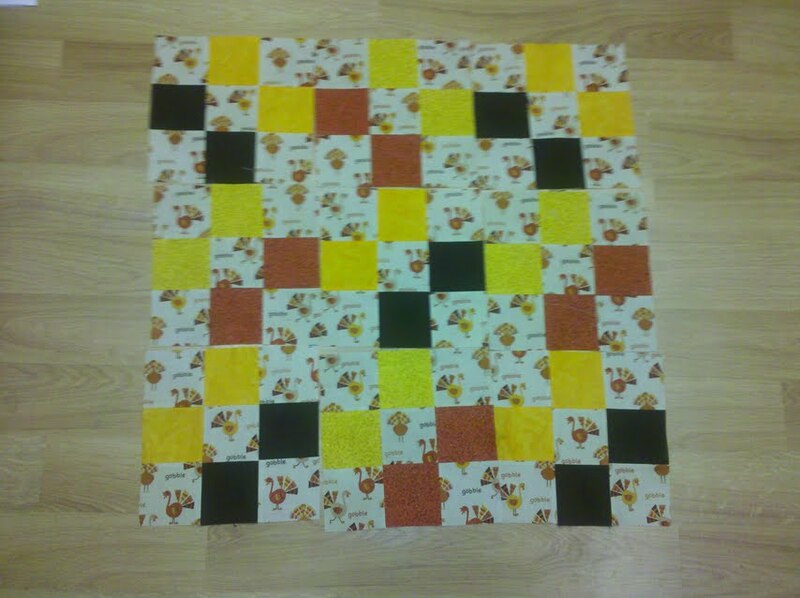 And below is the back of the gobble quilt. I used a yellow fabric with green/red/orange leaves on it. 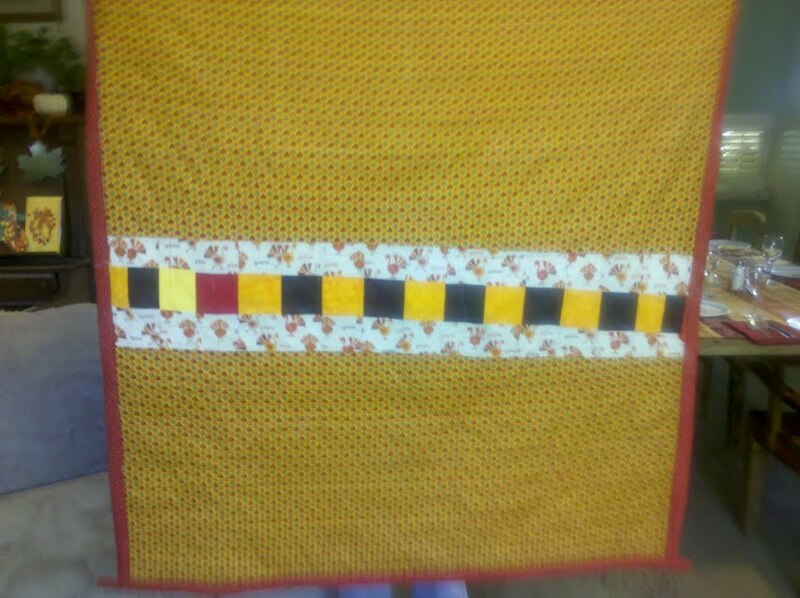 And the stripe down the center is made from left over pieces of the nine patches from the front. 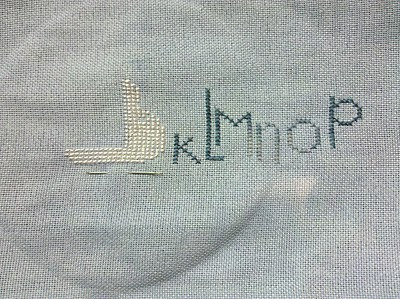 Which I swear were in a straight line when I sewed them together, though now they look really crooked in the picture. Anyways I hope everyone has a great Turkey day, filled with family and friends and lots of yummy food. I have been on a Bent Creek Row kick these last two weeks. I finished "Thankful Row" and it is now at the framers. Due back to tomorrow, just in time to be on display for Thanksgiving. And I just started this one, "Winter Row", and again I changed the colors more to my likings. 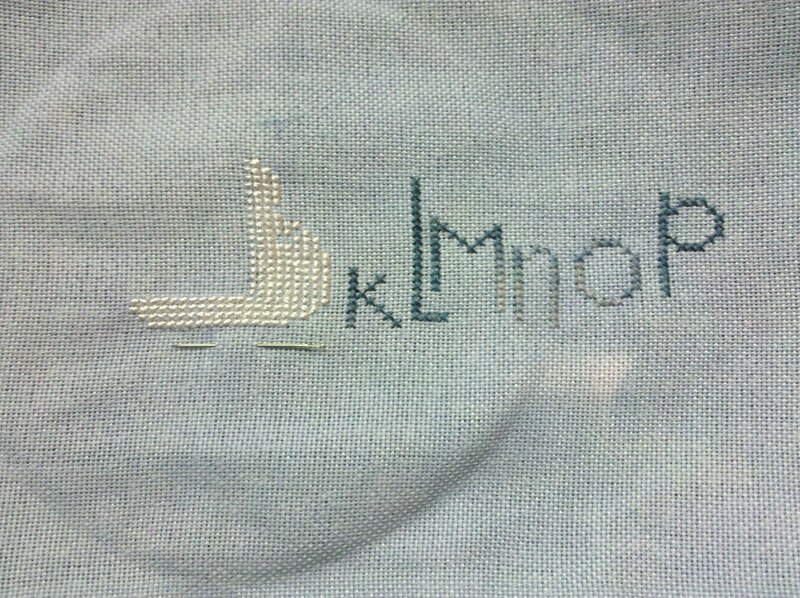 The letters were a brown, and I want them to look icy/frosty so I changed them to a variegated blue. 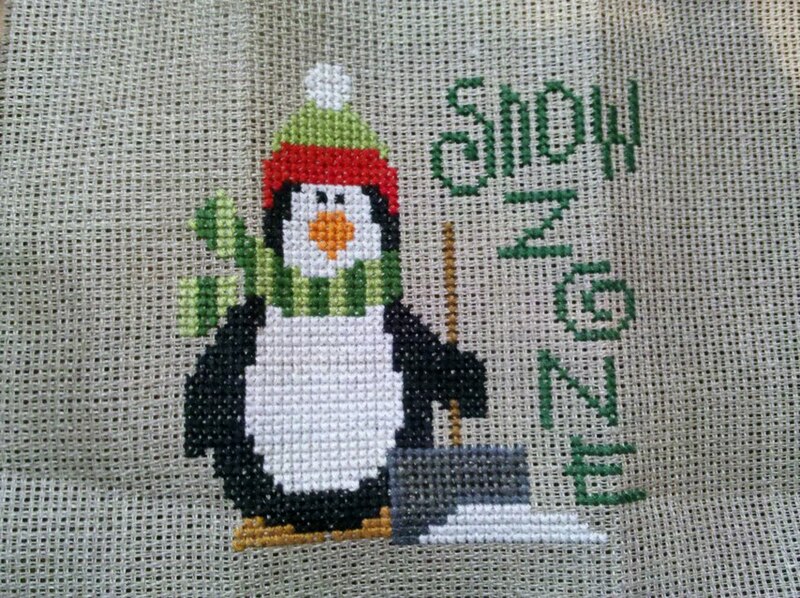 The snowmen are also being stitched in DMC silk to make them look extra chilly, and I am going to but some silver thread into the blowing snow. And this little peice is a gift that just arrived in the mail today. 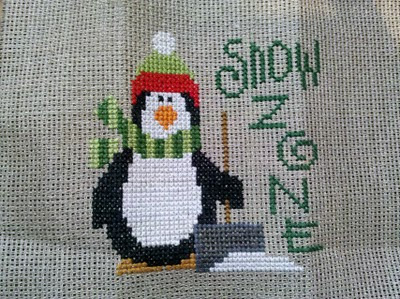 So cute, I think I am going to have to frame him though as he is too big to make into an x-mas ornament. Well hope your Thanksgiving prepartations are going well. I have house scrubbing to do tomorrow, and then a full day of cooking planned for Thursday. I am excited to be hosting it this year, but am starting to feel a little under the weather. If I can just stay healthy till Friday! Dayquil/Nyquil/Theraflu here I come. And no I didn't get my flu shot this year, and I can already hear my mother and her I told you so. SIGH! And the turkeys are in the lead! 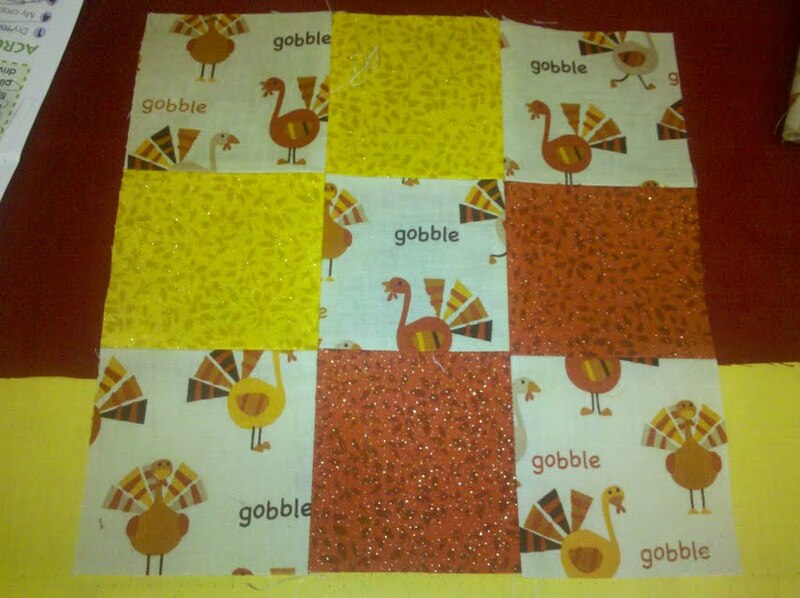 So I finished my gobble gobble quilt top today! Yeah for me. 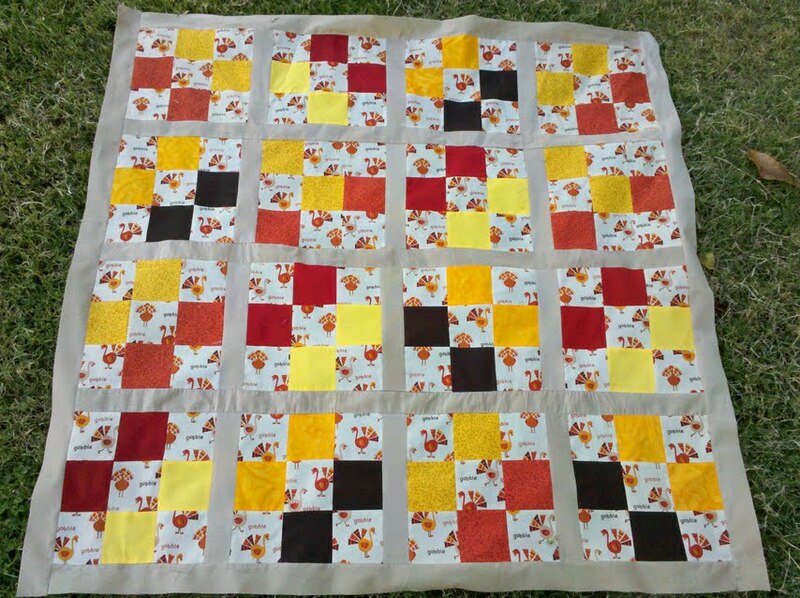 I have a super cute idea for a peiced back, i'm gonna use the extra squares from the nine patches to make a stripe along the center. 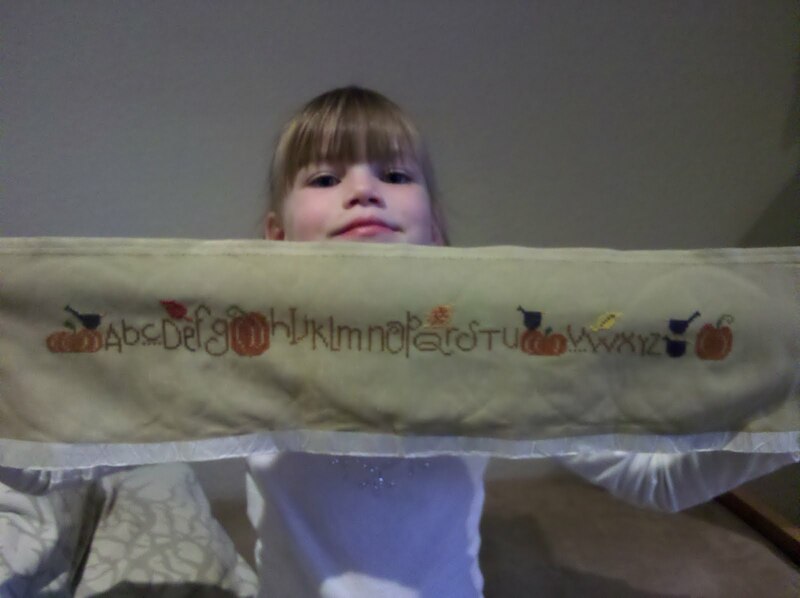 I used a soft corduroy for the sashing on this, to give it a little extra weight/warmth/snuggly-ness. I think it may just be done before the end of the week. I also picked up a pretty orange blendable (or in x-stitch terms "variegated") thread called Candy Apples to do the quilting with. 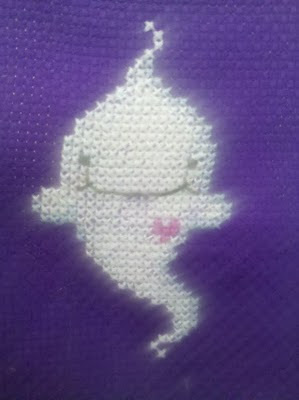 Though the backing fabric is pretty busy so i'm not even sure it will show. But I will know it's there. 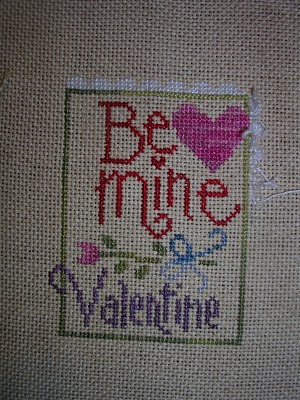 And this is my cross stitching for the week. It is a Bent Creek. 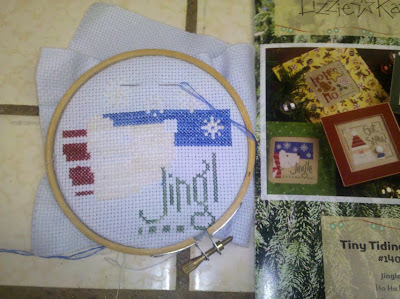 I'm just not ready to start stitching X-mas ornaments yet. I don't want it to be winter time yet! I changed the colors on this one. 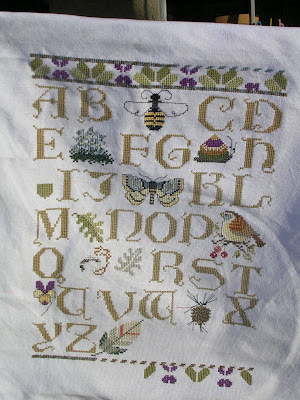 Originally the letters were supposed to be in brown, and the vine running through them was also a lighter brown. Me being a color girl couldn't resist changing them to a brick red, and the vine to a nice green. I think it still looks fall-ish, don't you? I can't make up my mind what to work on this month. My goal/X-mas present to myself is to have 10 new ornaments stitched for my tree this year. If you remember from last year I only have the one tiny little mouse for my own tree while I have made dozens of ornaments for friends and family. So this is my start on that goal. It is a Lizzie Kate, and oddly enough it is the only one I like out of this chart. But a part of me is not ready yet to start gearing up for Christmas/Winter and wants to enjoy fall just a little bit longer. We are having such beautiful fall weather, highs in the eighties and nights just a little cooler. It's the perfect time of year for walks to the park and a little work in the garden. Also I hate that all the stores are already bombarding us with Christmas stuff. I really think they overdo on the Christmas holiday season (it shouldn't last two and a half months!) 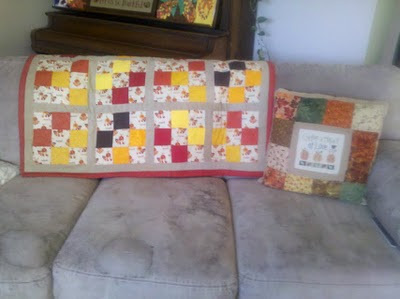 So this little lap quilt is my Thanksgiving quilt. The black looking squares are actually a dark brown. 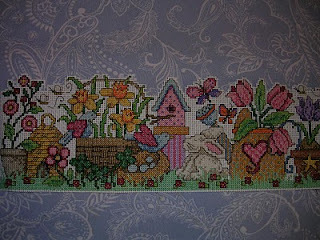 This is a close up of the fabric that inspired me to start this little quilt. Aren't the little turkeys just the cutest? The red and yellow fabrics have sparkle in them too. 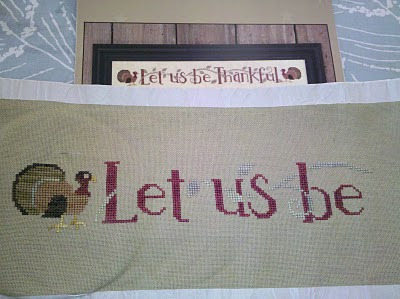 I know I can finish the top in time, but i'm not sure I will have it quilted in time for this years Thanksgiving. But I like to work on seasonal stuff during the actual season, so even if it's not done in time I will still love working on it for the Autumn theme. 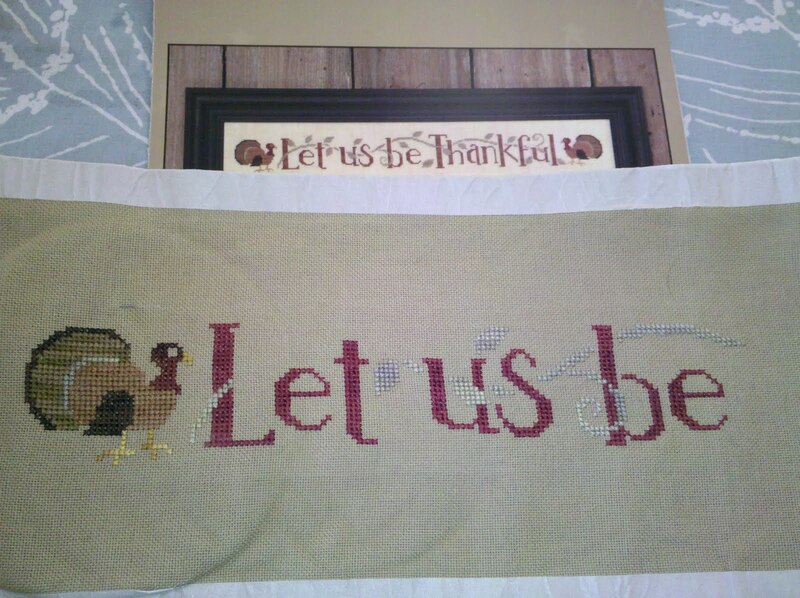 (And Jo-anns had the turkey fabric at 40% off already-yippee). Halloween Fairy has alas been put aside unfinished. 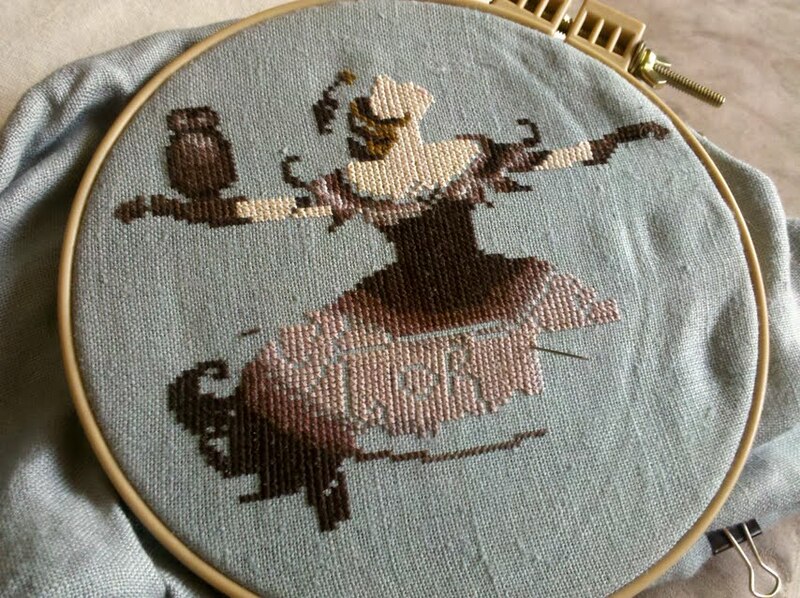 I decided that if I stitched the spiderwebs at her feet with the wrong color thread that it really would bug me for forever and ever and every time I looked at her. So I have mail-ordered the correct thread, and hopefully I will pick her up again and finish her once it arrives. This is trick or treat fairy, almost done. 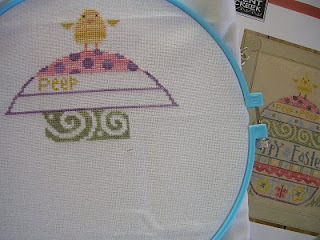 I have been hesitating on doing the moon/spiderwebs because I bought the wrong color Krienik, and I can't find it at either of my LNS so I will have to order it which means it won't be done in time for Halloween. 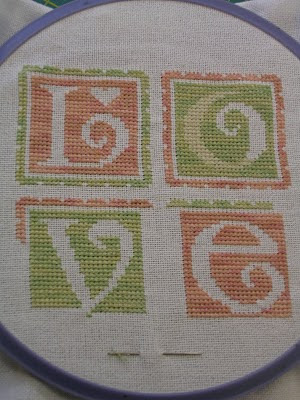 The thread I did buy is probably close enough, but if I use it am I going to notice it's wrong every time I look at it? So I am undecided...sigh! This is the Lizzie Kate "Bless our Home". 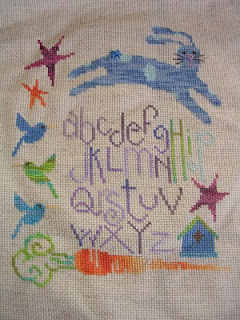 I finished it this week, it was a cute older one I have been wanting to do for a while. 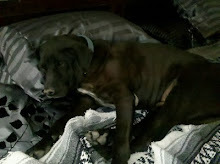 Sorry the picture is so blurry I was using the camera on my cell phone. This is us carving pumkins tonight. My seven year old worked on hers for two hours! !1 This is the first year I let her carve her own pumpkin, and she did good she still has all her fingers and no stitches needed! 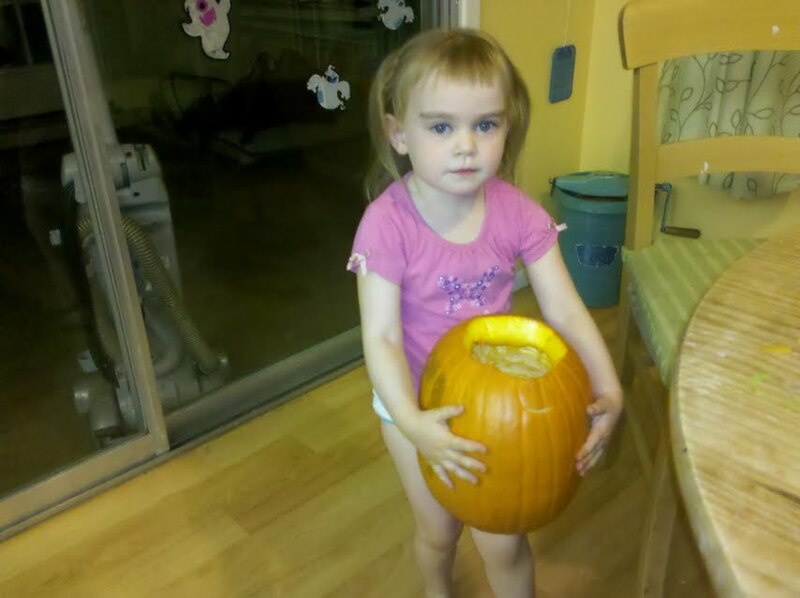 Her pumpkin was huge too, at least two feet tall. I made her gut the inside all by herself. 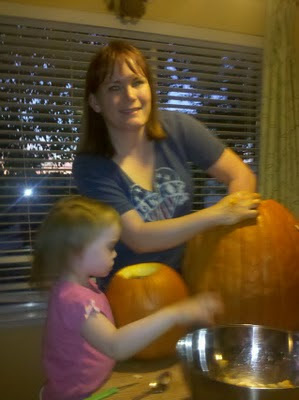 These two are my youngest hard at work on her pumpkin, with much help from mom. 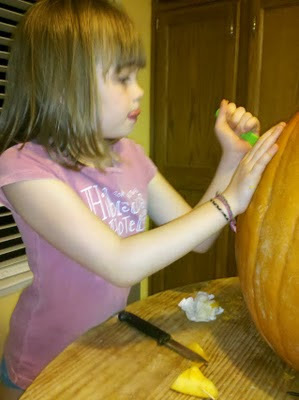 And the next is of me gutting my own pumpkin. For some reason the goop inside makes my hands itch like crazy the next day. I wonder if i'm allergic (but I can eat pumpkin pie by the pound! )We had such a fun week. Tuesday we went to a local pumpkin patch to pick our pumpkins. Last night we went to the state fair, where I got my fix of indian fry bread (west coast version of funnel cake but wayyy better!) I even rode a few of the roller coasters with my oldest. And tonight we carved our jack o'lanterns. Fall is most definitely my favorite time of year. Hope everyone out there is ready for Halloween. I just went and bought my candy today, now if I can only make it last until Sunday. Today I finished all the "regular" stitching on Trick or Treat fairy. 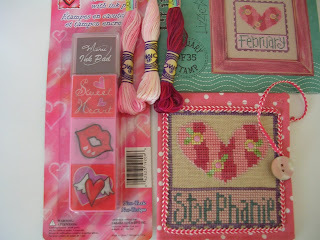 Tomorrow comes sparkly threads and beads. Can I finish it tomorrow? It doesn't look like that much more, just the cobwebs by her feet and the moon then the beads on her dress. 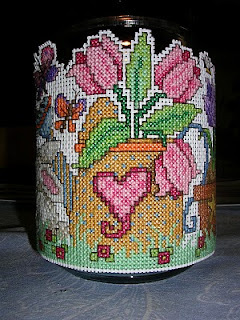 I just hope I still have all the beads and Kreinik threads I need. 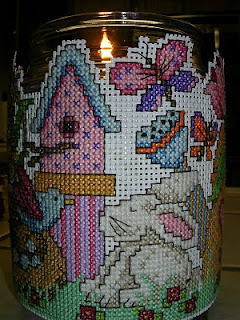 I went and bought them two weeks ago and put them in one of my cross stitch tubs (yes I have enough cross stitch stash to fill several 5 gallon tubs....my name is Stephanie and I am no longer in control of my stash) So I hope they all stayed together, as sparkly threads and beads have a way of growing little feet in my house. 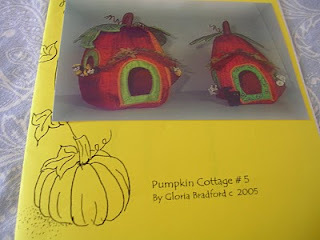 And because yet again I have the attention span of a cocker spaniel, and I couldn't take anymore of Trick or Treats blacks and browns, I started another little project. I needed a fix of brighter colors and cute. 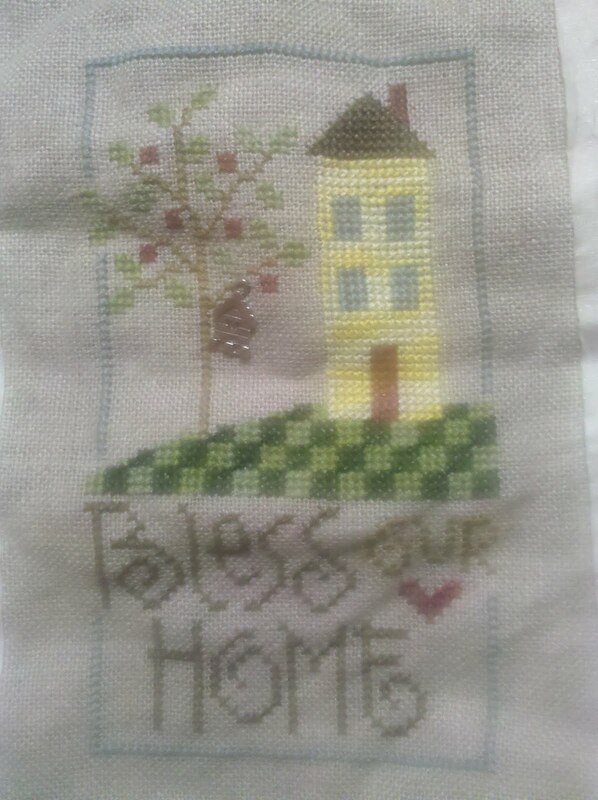 So I whipped up this little Lizzie Kate "Bless our home" chart. I just have to finish the border and grass (which I will probably do tonight while watching Netflix (what a thrilling Saturday night!). I want to make a cute little door pillow out of this. Hooray for me!!! 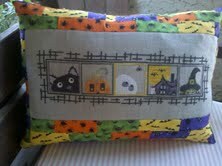 I finished my Halloween pillow this afternoon, even with 1 sick kid and another kid home from school on a half day. My three year old sat with me in the kitchen and pretended to sew along as I worked on this. While the sick seven year old zoned out on the couch to her latest Netflix movie. She's not sick enough for me to make her stay in bed all day, but she is certainly sick enough to complain heavily and expect to be waited on hand and foot for it. I'm just hoping not to catch whatever she has. This is a close up of the pillow. It was put together with an idea rather than a plan for what it would look like. So I kind of winged it all as I was sewing it together (how unlike me I know!!!) I actually decided to skip the charms, as this pillow's place will be on the couch where it will receive lots of attention from kids and dogs who would just turn the cute charms into a choking hazard. 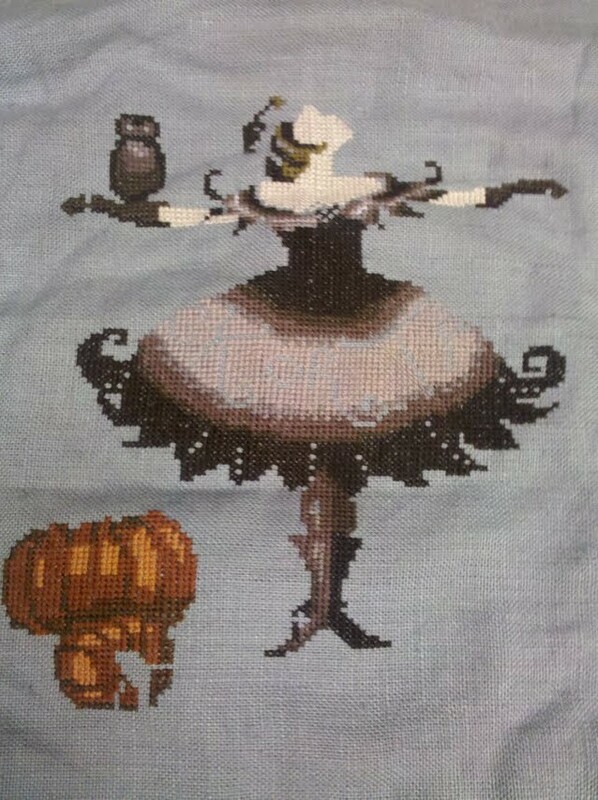 And this is my little bit of progress on Halloween Fairy. I think I can-I think I can -I HOPE I can have her done in time for Halloween. After the other leg and pumpkin are done then comes the beading and sparkly threads. 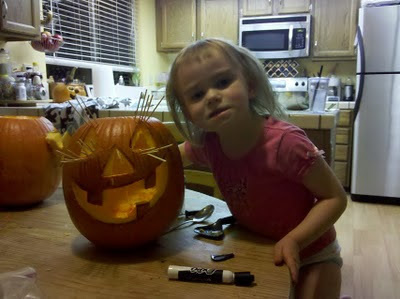 I'm not sure if that will be quick work or just a pain in the pumpkin! This is my Mirabilia "Halloween Fairy", almost done. I just want to have all the stitching done by Halloween. She doesn't have to be framed in time, but just knowing she will be ready and waiting for next Halloween and can be out and displayed for all of October next year. I have to give a little rave to "Just Cross Stitch & Needlework" on this one. They have earned my subscription! 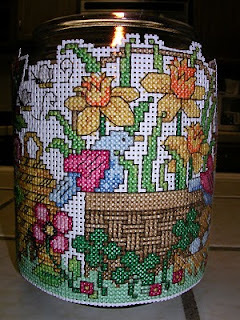 I had seen this pattern several times on other peoples blogs and loved it. Well you can't buy it as a chart, at least not that I found. 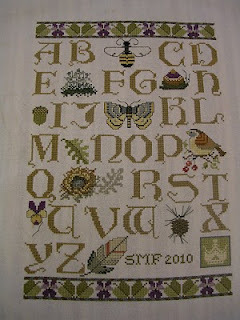 She was a project in Just Cross Stitch in Sept 2008. 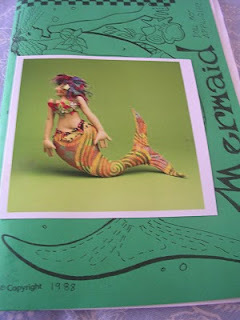 I checked on ebay and the going price was about $20 for the magazine since it is out of print. So I wrote the magazine asking if they had any back issues. They said no, but they do reprints for $3 bucks. So I was very happy to save myself $17 dollars on this one. 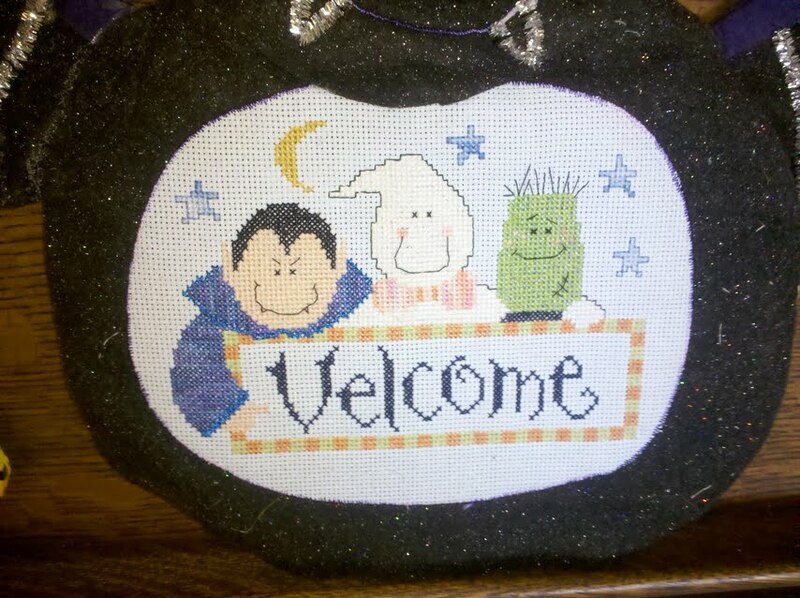 This is part of my Halloween decor. 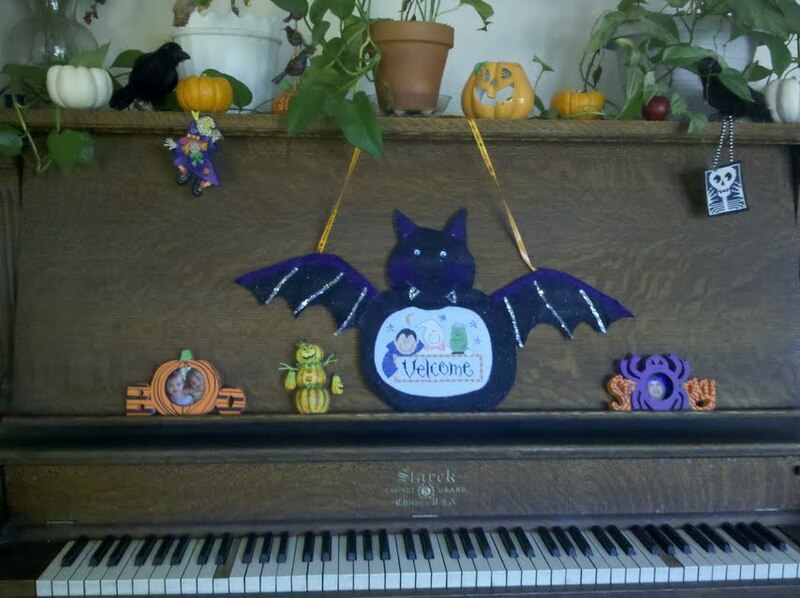 The middle bat was made by me to frame the Lizzie Kate, and I often get asked if my seven year old made it. Honestly it's made out of felt, sparkly pipe cleaners, and hot glue! But it makes me smile every year when I pull it out. And this is what is framed inside the bat. It is a Lizzie Kate, and I love the variegation of the threads, especially on the little vampires cloak. 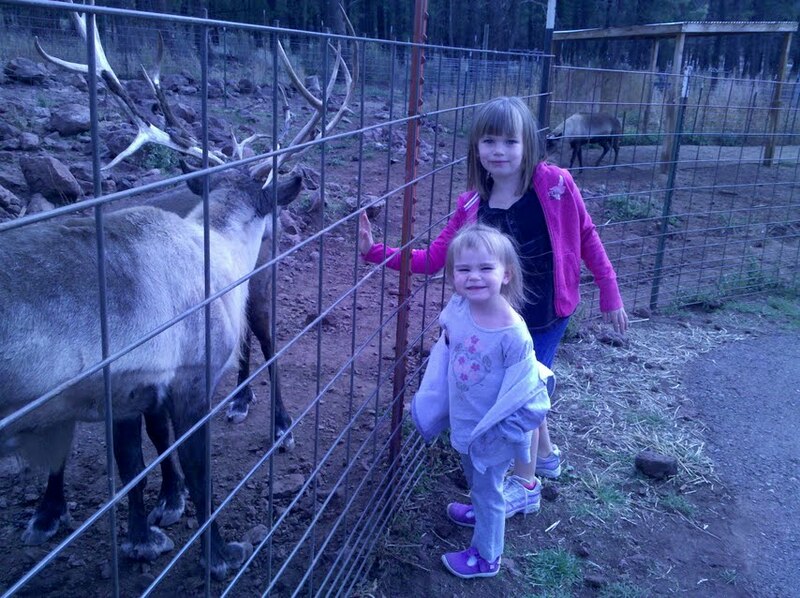 We went to the deer farm yesterday outside of Flagstaff. It was nice just to get out of the heat, and it rained a bit while we were up there. It's still 90 degrees here during the day, and we see rain maybe twice a year so rain and cool weather are super exciting. The leaves were changing up north so it was a nice drive. 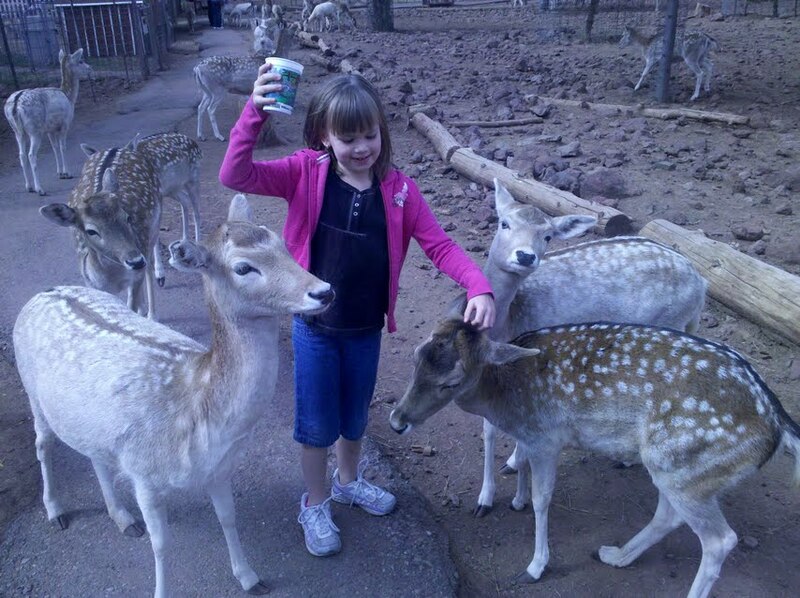 The deer here are so funny. 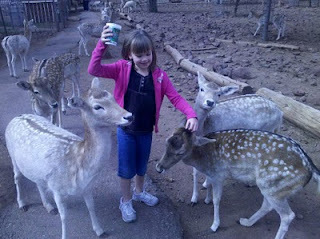 My oldest literally had a pack of 15 deer chasing her down the trail to get fed. 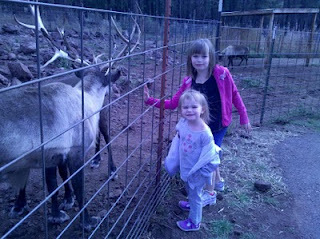 My youngest who is three, was not so thrilled over the pushy deer, even after several Bambi references. After about 30 minutes she finally got brave enough to pet them. 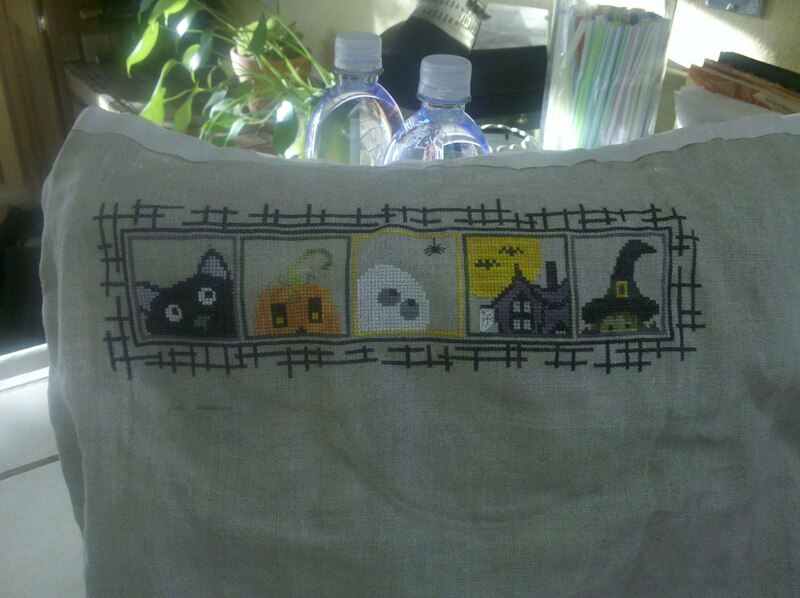 This is my finish for this month, hopefully this weekend it will be turned into a cute Halloween pillow. Halloween is my favoritist favorite of holidays. 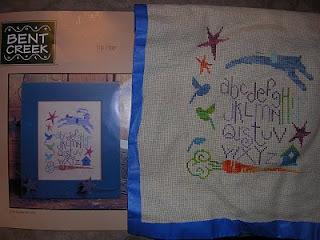 This is a Trilogy design, and it came with a charm pack of buttons and charms that I still have to sew on. And of course I ran out and bought extra charms to go on it because you can never have too much bling! 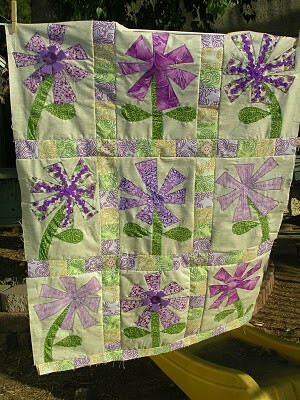 I have also started two Mirabilia designs. 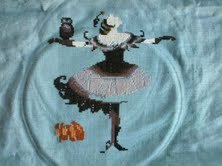 "Shakespeare's Fairies" and "Halloween Fairy" from Just Cross Stitch and needlework. I will rave about them in a later post as soon as my camera will take pictures of them. 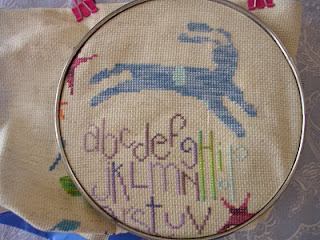 For some reason ( I was using my cell phone to take pics) but it cut me off after the two of this project. 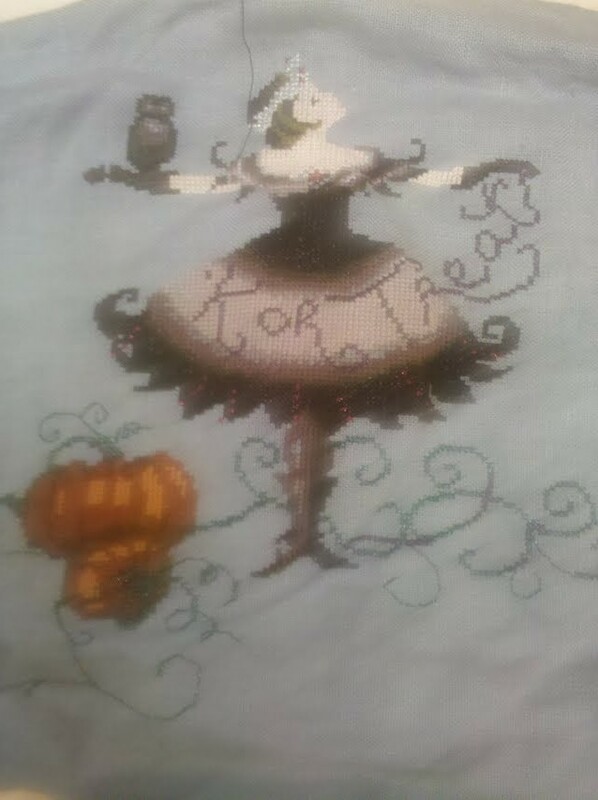 I am hoping to have the Halloween Fairy done in time for Halloween, she is soooo pretty. I know it has been a while since I have been active in blog-land. It has been a difficult year. 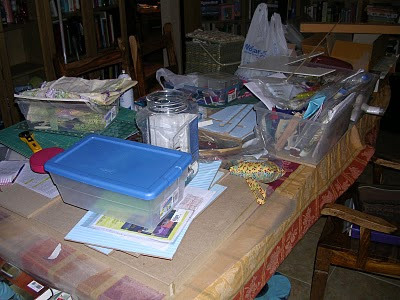 Personally I am going through a divorce and the accompanying move/divying up of stuff that goes along with it. So honestly I have been too sad/stressed to blog. 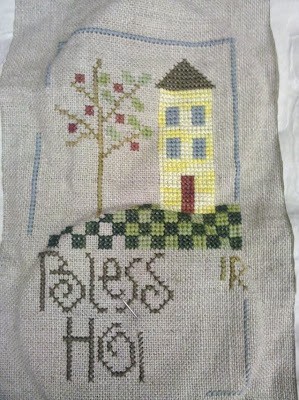 But I have still been cross stitching and now I am starting to see light at the end of this part of my life. I know there must be something better in the future for me, whether that future is alone or with somebody else. And I am still very blessed with all I have, my children, my job (lots of people are still wishing they had jobs these days), my new home, my family who has supported me so much through all of this, and last but not least creativity which gives me a much needed outlet/distraction at the end of the day!